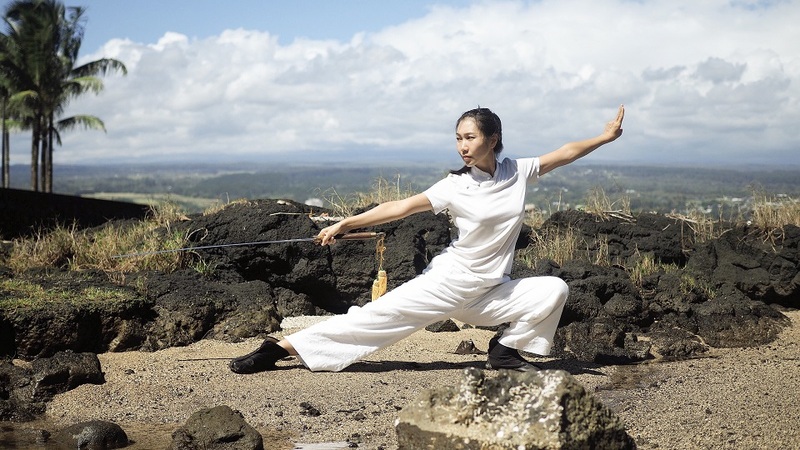 As UH Hilo celebrated Chinese New Year, a woman moved slowly through the Library Lanai with her gaze focused and body assuming multiple forms, as she demonstrated the Chinese martial art of Taiji. Ke Kalahea interviewed Stein about Taiji and the “Qi,” energy and “Yi,” spirit, of her practice. Tell me about your practice. What is it called? VS: Actually the common English name is tai chi, but in China we call it Taiji. Everyone here says tai chi, just like how in China we call the Chinese food “chow mean,” but here they say “chow mein.” I think it’s funny! How did you get involved with Taiji? VS: I was born in a Taiji family. My grandfather was a Taiji teacher and he wrote a book about Taiji that was published in China, that made him kind of famous. My mom, my uncle, and my aunties all studied Taiji so I started very young; they influenced me. How did your journey with Taiji bring you from China to the University of Hawai`i at Hilo? VS: In 2016 I had a chance to become a disciple of an international Taiji Master named Dong Zeng Chen. My grandpa was a student of Master Dong’s uncle and he also became a disciple of Master Dong. In 2013 Master Dong came to China and he taught me a little bit. He said I had a lot of potential and he was willing to teach me. A disciple must go through a ceremony where you light incense and kneel before the master called rushi dizi. Being a disciple means you aren’t like other students. The master will teach you more details and you have to be a descendant of their Taiji form and style. In 2016 I came to Hawai`i to be a disciple for Master Dong, who was living in Honolulu. I worked for five months practicing with foreign students and working in Master Dong’s workshop. After becoming a disciple and learning more, what level are you now? VS: I think I am still learning. I cannot say I am at a high level because “Taijiquan” (tai-JI CHU’-an) needs a lot of practice, even decades long. I have studied Taiji for about 20 years but I need to keep learning. Every day I make progress. Taiji is a martial art that requires lifelong learning. You may need several decades or your entire life to keep learning. You said a word there: “quan,” what does that mean? VS: Quan means fist. The Chinese name is Taijiquan. Some people translate this as Chinese boxing. I find this funny because boxing is an external martial art, but Taijiquan is an internal martial art. You say Taiji is an internal martial art. What does that mean? VS: It means that Taiji is a combination of mind, body, and spirit, unlike other external martial arts. For example, boxing you need your movements to be fast, strong, and powerful, but for doing Taiji you need to concentrate, you need to look inside of your body, and inside of your spirit. It’s not just a sport. It’s a way of spiritual practice rooted in Chinese traditional culture. When you are practicing you must concentrate on yourself and use “Qi” (CHI’), a kind of energy or life power, and “Yi” (EE’), that’s your spirit, mindfulness, and intention. It’s hard to translate the depth of the meaning of the vocabulary of Chinese martial arts. If you achieve a high level you may feel Qi is filling your body. You can feel Qi from your Dan tian, or your belly, flowing and Yi coming out from your fingers. What has Taiji brought to your life? How has it influenced you as a person? VS: I think Taiji benefits both my body and my mind, I seldom feel sick. I feel my mind is very peaceful. I seldom feel angry and my mind is very balanced and even. I think being peaceful in your mind can help you live longer. When I am working sometimes I feel pressure, Taiji makes me less stressed. After I practice Taiji, my whole body is relaxed and hours of stress are gone. I think it’s very useful for the modern life style. People need to relax and calm down from their work. They need to be aware of their health. What would you say to somebody who was interested in Taiji but didn’t know how to get started? VS: If there is a workshop they can learn some basic posture and movements. They can find a teacher, or a good master, to help them with the basics. Learning Taiji is a long journey. For new students they may need three month to learn a basic form. They may need a year to make the posture movements skilled. They may need three years to feel Qi and Yi. They may need 10 years to achieve another level in order to feel internal energy. To learn Taiji people need to be patient with strong determination. You got to demonstrate Taiji here on campus on the Library Lanai. What did it mean for you to be able to share with the students here? VS: I am very happy I can show Taiji, Chinese traditional martial arts, to the world. When I was practicing, I felt like martial arts was the most popular performance. If someone had never heard of Taiji it may have made them curious. I met a girl who wanted to learn a Taiji form from me. I’m happy; that’s a good start. On March 18, there is another Chinese culture event where we will be interacting with local kids. I will be teaching elementary kids basic movements of Taiji such as holding the ball, or in Chinese, “bao qiu” (BOW’ CHI’-o). It really benefits both body and mind, I think that is a treasure. How does Taiji effect the way you are able to do in the classroom? VS: I am taking an ESL (English as a Second Language) class. Internal martial arts can help develop intelligence. I am learning English but it is not that difficult. Training in internal martial arts for a long time has made learning anything much easier and peaceful. I don’t feel pressure from the classes. I am learning English because I want to be a disseminator of Chinese culture and Chinese traditional martial arts. To do so, I have to improve my English first. I have a long term goal. First: improve my English. Second: I will do something around the Taiji and martial arts field. I am happy that I am here and learning English so that I can meld two cultures together. My final question is about the sword. When you practice Taiji how does the sword come into play? VS: The sword is my favorite weapon. I learned the sword from two Wudang masters from two Wudang masters, Wang Ming Shan and Qing Feng Zi. They both are descendants of the Wudang branch. Wudang is a mountain in China. It is the place where Taiji originated. The founder of Taiji is a monk whose name is Qing Feng Zi, he lived in the Wudang mountains. The sword and Taiji benefit each other. The sword can give me more power. Although Taiji looks very slow and gentle, the movements are very powerful inside. I have explosive power from practicing with the sword. I put that power into my Taiji training. I put the energy into my form, and I feel that my form is more powerful than before.